PLEASE SHARE THIS FLYER WITH POTENTIAL FTC PARTICIPANTS! Teams, we are expecting rain Sunday so please bring a tarp or something to cover up your materials while transporting and plan for dealing with the weather conditions, especially considering the parking considerations below. We will have food trucks at the venue from about 10:30 to 1:30. Meals from the trucks will cost between $8 - $12. You may bring your own food to the event but you will need to eat in designated areas out of respect of the venue. No BBQ’s please. Anyone in the pits or on the competition field must wear safety glasses. We will not provide glasses. Teams are required to provide their own for team members and mentors. Note: judges will be wandering the pits, some of them not identifiable. Please be sure to impress them with your correct usage of safety glasses! At the end of 6 qualification rounds, the top 4 ranked teams will select two partners each to form 3-team alliances. The playoff matches will be best 2 out of 3. Please read the game manuals for more details. 3 Teams from the San Diego region championship will advance to the World Championship per the advancement criteria in the Game Manual. Consent Forms and STIMS Rosters. Thank you all for submitting these in a timely manner. If you bring students with the team that are not on your roster, bring a paper copy of an updated roster or have them fill out an individual consent form. Check-in starts promptly at 6;45. Please be on time and plan your time for the parking issues mentioned on this page – this is critical to everyone having a good day. One mentor will check in the team at the check-in table and turn in the team’s Engineering Notebook for the judges to review. To be considered for the control award, your Control Award Content sheet must be in the front of the engineering notebook when you turn it in. Two team members will take the robot directly to either field (at the fields) or hardware inspection (at tables near the entrance). The remaining team members go to the pits to set up. Please see the judging/inspection schedule to know whether to go to hardware or software inspection first. Teams in 7:30 judging are allowed to go straight to their pits but should go to inspections immediately after their judging time is finished. All other teams should note you can NOT take the robot to the pits until it has passed inspection, so come with your robot "test ready." You are required to bring both the robot and field pre-completed checklists to inspection. Please fill this out before coming to the tournament to ensure inspections go efficiently and so you can avoid having your robot disqualified. We will not have the capacity to print these forms out on site. Note: all rules will be fully enforced at this event. Please be sure you have completed a thorough self-inspection before coming to the event even if you passed at previous events. Be mindful of the power switch requirement this year that will be fully enforced. Don’t bring your engineering notebook to judging. Instead, turn it in at check-in. 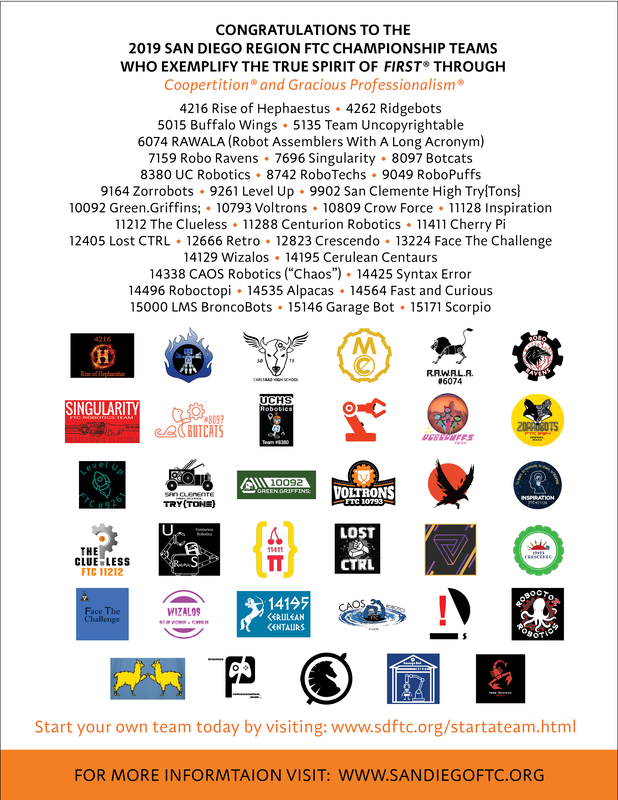 We are hoping to have more space than a 6' table, but space is still limited so please, no pop-up tents or 10’ x 10’ booths out of respect for other teams and our space constraints. You will be provided one outlet so please bring your own terminal strip. Teams are going to be pitted in numerical order. I know that has an impact on a few schools with multiple teams but it makes it more difficult for the judges, who we all want to keep happy , if the booths aren’t in numerical order. Teams - Francis Parker has been Gracious enough to host our event this year BUT the parking is going to be a challenge due to delayed construction. Each team will be emailed a parking pass for a vehicle drop off equipment at the lot designated "Heavy Item / Robot Drop-Off." 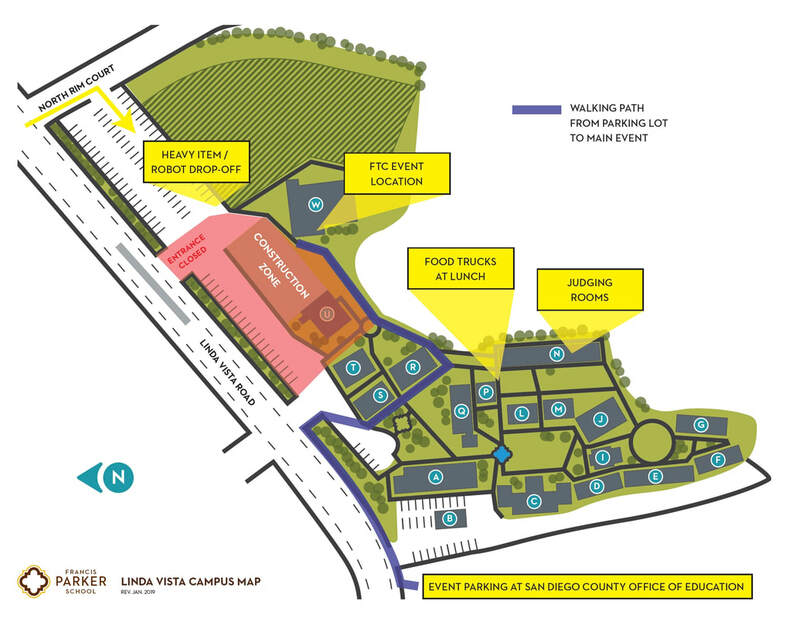 All other team members, observers and volunteers should plan on parking at the adjacent San Diego County Office of Education parking lot or on city streets adjacent to the property. PLEASE respect the flow of traffic, security guards and parking attendants in the heavy item/drop off lot. We are hoping to have enough parking spots for one car from each team in this lot as well as the off load area. IF you can park and unload in this lot, please do so instead of occupying the drop off zone. To reiterate, ONE vehicle per team in this lot. We have other volunteers and essential personnel that will also need to park in this lot. Qualifying Teams and Status - all teams are check in - thank you!!! 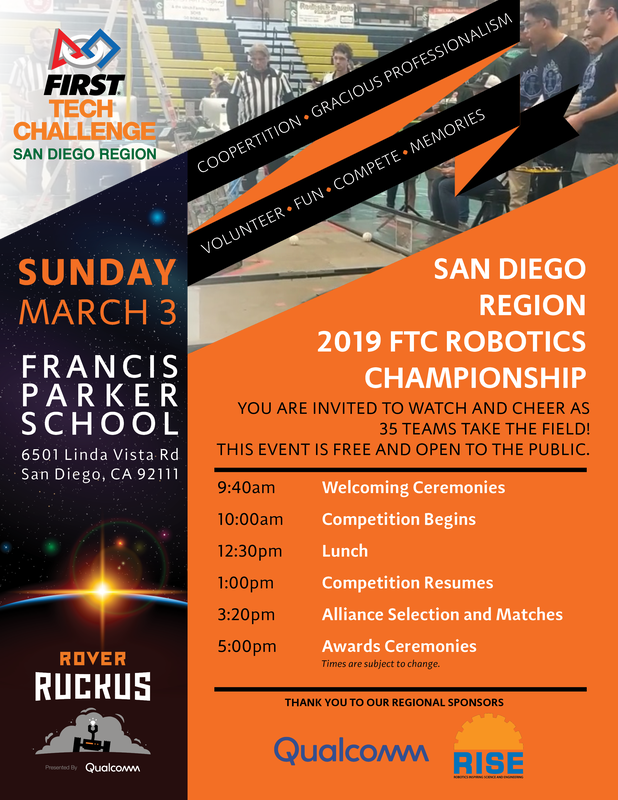 Welcome to the San Diego FTC 2018-2019 Regional Championship information page. This information will be updated frequently, so please check back often. On this page you will find everything your need to participate in the San Diego Regional. The following 3 items are required by 2/23/2019. 3: Payment ($175 per team): Due by 2/23/2019 - use the paypal link below!